Back in 1995, Aicom released the game Pulstar. 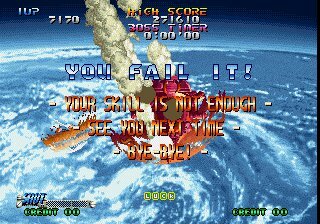 Pretty much universally acclaimed as one of the best shoot 'em ups on the Neo Geo (or indeed any platform), Pulstar was a great game, albeit one that came with a hefty difficulty level. Some time later, with funding from SNK, Aicom broke away from their parent company Sammy and changed their name to Yumekobo. Blazing Star, a sequel to Pulstar was the first game that they released on the Neo Geo hardware. Pulstar is one of my favourite Neo Geo games, but how does Blazing Star match up to it's predecessor? 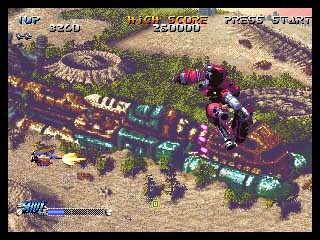 Compared to it's predecessor Pulstar, Blazing Star is a much faster paced style of game. It relies more on reactions, and less on memorising enemy patterns. It's a one hit and you die style of game still, and you're going to need swift reactions and forward planning to stand a chance of getting through it without using credit after credit... but it is a little bit more forgiving in terms of difficulty than the aforementioned game was, which may please some! Shooting down the incoming enemy hoards throughout the course of the game is done using two buttons for attacks. using these two buttons, you can fire a variety of different shots depending on how those buttons are pressed. There are also six different craft to choose from, each with their own distinct abilities. The A button fires your ships standard shot when tapped (above screen to the left), however rapidly tapping the button fires a more powerful version (above right). If you hold the A button down your craft will charge up it's special shot; releasing A unleashes a powerful attack, and the length of time this goes on for depends on how long you charged it up for. You can also pick up power-ups during the game that will increase the energy meter in the bottom left corner, allowing for more powerful attacks. While your special shot is underway, tapping the secondary attack button changes the charge shot to a different one. For example, the "Hell Hound" craft by default shoots a powerful fireball that is concentrated directly in front of it. Tapping the B button while it's still firing switches this to a less powerful shot, but one that spreads out across the screen; often useful when you are surrounded by smaller enemy craft. Each craft has its own unique abilities, so you're best to find one that suits your personal playing style. Along the way there are a number of items you can collect during the course of Blazing Star's seven stages. There are the aforementioned powerups that increase your firepower, but there are also many bonus items that increase your score. Angel wings give you a score multiplier for a short time, blue gems give you points, and finally there are the five letters on each stage that spell out "L-U-C-K-Y". Collecting all of these will give you another points bonus at the end of the stage. While this game may not be anywhere near as difficult as Pulstar, it's still a challenge, especially on the higher difficulty levels. Most people should be able to get through the first couple of stages, but after that it becomes a much bumpier ride, featuring "bullet hell" sections" and some tough boss fights, so you'll need to be on the top of your game. Blazing Star really is a lovingly crafted and beautiful game to look at. It uses a combination of pre-rendered graphics converted into 2D sprites, as well as standard hand drawn sprites. There are also a few short pre-rendered introduction sequences with some brief anime cutscenes, that are quite pretty to look at. I'm not always a fan of designers taking the pre-rendered graphics route as it can make games look grainy and not particularly appealing, but when it's done well it's fine... and it's certainly been handled in a good way by Yumekobo! Both the enemy and player ships are well animated and everything moves fluidly with only a little bit of slowdown. The backgrounds are also varied and good to look at, and importantly for a shoot 'em up, bullets don't get mixed in with the background, so when you die you can't really use the excuse that you "didn't see it coming". There are a few areas where pre-rendered backgrounds are used, and while it's pretty much a loop of the same thing over and over, it gives an impressive feeling of depth. It looks more impressive in motion, but see the screenshot above for an example. The only downside is a bit of slowdown at times, but it's nowhere near a game breaker. Overall, top marks Yumekobo! The audio experience in Blazing Star does divide opinion a little bit. The music is undoubtedly excellent and features brilliantly composed electronic tunes that suit the on screen action perfectly. All of the usual explosions etc that you would expect from this type of game are fine too... but then there's the speech. There's nothing particularly wrong with it, but I know some people that say they were quite frankly driven mad by the excessive use of one particular speech sample. Every time you collect any kind of bonus you're subjected to the announcer shouting "BONUS", and it does get a little repetitive. I must say that after a few plays, it just becomes par for the course and you don't really notice it at all, or at least I dont anyway. Even after all the years I have played this game, I still enjoy listening to the soundtrack though. I would definitely recommend clicking the link on the menu to your left for the SNK Jukebox and searching for the handful of Blazing Star tracks that are on there! Top notch, and amongst the best you will find on this system. 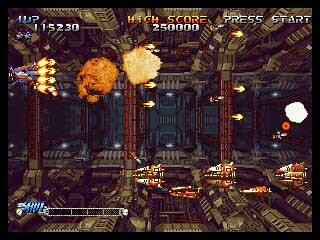 There are plenty of good shoot 'em ups on the Neo Geo, but among them there's a handful of really exceptional ones, with Aicom/Yumekobo's efforts being right up there. So, for the inevitable question: Is Blazing Star better than Pulstar? I think that all depends on your own personal taste. I stated above that Pulstar is very hard, so if you really like a challenge that will take great skill to get through then you might be better off playing that. If you aren't a complete �shoot �em up demon� then you may prefer this game though, although that's not to say that it requires no skill; it's just a different style of shoot 'em up is all. Personally I love 'em both to pieces, but I just about prefer this game, however I do change my mind from time to time on that. Either way, buy one of the two and you are unlikely to be disappointed. However, home console owners should be aware that the home cart of this game is quite expensive, so unless you are flush for cash, the easiest way to own it is by purchasing the MVS cart. Failing that, you can go the emulation route or perhaps even try the more recently released iPhone version, but nothing beats having the original! SEE YOU NEXT TIME- BYE BYE!!! Above links open in new window. Another amazing Neo Geo shooter!